What he does is, as the Commander-in-Chief, he also delegates responsibility to Cabinet officers. It bears repeating: the President is the Commander-in-Chief of the armed forces, not of the nation, its citizens or Cabinet officers. Between their fetishes for "C-I-C" and "pleasure of the President", what a bunch of leather slaves these Republicans are. Why not just call Bush "Master", or better yet "God"? One gets the impression they simply love mouthing the words "commander" and "pleasure" in relation to Bush. A number of incomplete statements were made by this department concerning the futility of any modern cartoonist attempting to tell a successful Captain Marvel story. Comments were submitted to the effect that this--like Kirby's New Gods, Cole's Plastic Man and Eisner's Spirit, was a property animated by specific talents, and which spoke to a specific cultural and historic moment long gone. Testimony was delivered that DC had never managed to successfully recapture the spirit of the C.C. Beck salad days. Denny O'Neil failed. Roy Thomas failed. Jerry Ordway failed. Geoff Johns failed. The short, charming run on the character by E. Nelson Bridwell and Don Newton was considered to be the exception that proved the rule. 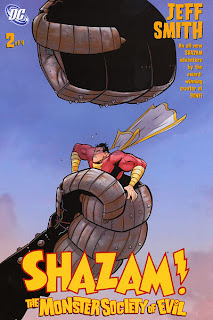 Jeff Smith has apparently rendered these statements inoperative with the first two issues of Shazam! The Monster Society of Evil. Against all odds, this series manages to evoke the whimsy of the classic rendition without being a slave to it. It seems to genuinely speak to contemporary kids rather than speaking to the inner children that 45-year-old men not-so-secretly harbor in their doughy/sunken bosoms. It has a light touch, a dash of Roald Dahl-style menace and perfectly calibrated ambitions. Most importantly, it was a hit with the department's 8- and 4-year-old sons, who thrilled at the alligator men, laughed at Billy's little sister, and loved fitting the back covers together into a bigger picture. I am accountable. Of course, many statements are made by this department every day, and in any event, the underlying assertion is still valid. I remind you that I have overcome many personal obstacles of a highly personal nature to become the CEO of this department.